﻿If ﻿you’re ﻿using ﻿a ﻿custom ﻿bars ﻿mod, ﻿this ﻿mapping ﻿may ﻿or ﻿may ﻿not ﻿matter. ﻿WoW ﻿G910 ﻿follows ﻿the ﻿state ﻿of ﻿the ﻿Blizzard ﻿action ﻿bar ﻿slots ﻿not ﻿the ﻿keyboard ﻿buttons ﻿you ﻿push. ﻿Next, ﻿click ﻿on ﻿the ﻿MultiActionBar ﻿page. ﻿This ﻿page ﻿shows ﻿another ﻿18 ﻿action ﻿bar ﻿slots ﻿WoW ﻿G910 ﻿follows ﻿to ﻿change ﻿key ﻿colors. ﻿You ﻿can ﻿assign ﻿any ﻿key ﻿to ﻿any ﻿of ﻿these ﻿action ﻿bar ﻿slots ﻿(Left ﻿1-12 ﻿and ﻿Right ﻿1-6). ﻿In ﻿Step ﻿2 ﻿below ﻿you ﻿can ﻿choose ﻿to ﻿show ﻿these ﻿action ﻿bars ﻿on ﻿screen ﻿or ﻿you ﻿can ﻿hide ﻿them ﻿after ﻿placing ﻿spells ﻿on ﻿them. 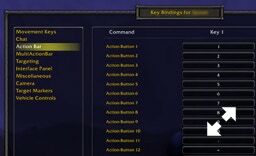 ﻿Again, ﻿if ﻿you’re ﻿using ﻿a ﻿custom ﻿bars ﻿mod, ﻿the ﻿mapping ﻿of ﻿these ﻿keys ﻿may ﻿or ﻿may ﻿not ﻿matter ﻿as ﻿WoW ﻿G910 ﻿tracks ﻿the ﻿status ﻿of ﻿the ﻿Blizzard ﻿action ﻿bar ﻿slots ﻿not ﻿the ﻿buttons ﻿you ﻿push. 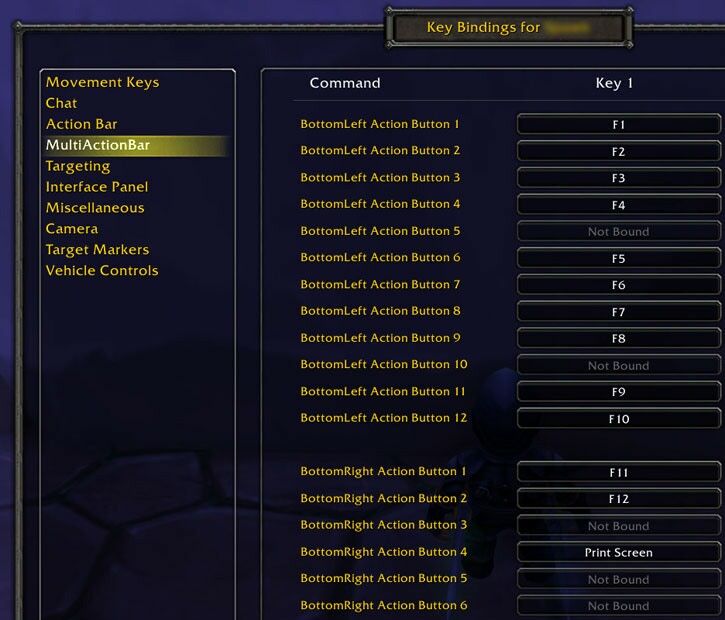 ﻿The ﻿graphic ﻿below ﻿shows ﻿where ﻿the ﻿30 ﻿action ﻿bar ﻿slots ﻿tracked ﻿by ﻿WoW ﻿G910 ﻿appear ﻿in ﻿the ﻿default ﻿Blizzard ﻿UI. ﻿The ﻿main ﻿action ﻿bar ﻿(action ﻿bar ﻿1) ﻿is ﻿always ﻿visible ﻿(unless ﻿you ﻿have ﻿a ﻿bar ﻿mod). ﻿Certain ﻿classes ﻿have ﻿multiple ﻿main ﻿action ﻿bars, ﻿for ﻿example ﻿rogues ﻿in ﻿stealth ﻿and ﻿warrior ﻿stances. ﻿You ﻿can ﻿place ﻿different ﻿spells ﻿and ﻿abilities ﻿on ﻿the ﻿main ﻿action ﻿bar ﻿in ﻿those ﻿different ﻿modes. ﻿WoW ﻿G910 ﻿will ﻿update ﻿the ﻿key ﻿lights ﻿when ﻿the ﻿game ﻿changes ﻿action ﻿bar ﻿1 ﻿for ﻿different ﻿class ﻿modes. ﻿Above ﻿the ﻿main ﻿action ﻿bar ﻿you ﻿can ﻿show ﻿the ﻿Bottom ﻿Left ﻿Bar. ﻿The ﻿Botton ﻿Right ﻿Bar ﻿gets ﻿added ﻿to ﻿the ﻿right. ﻿From ﻿the ﻿main ﻿game ﻿menu, ﻿choose ﻿Interface, ﻿then ﻿ActionBars ﻿(as ﻿shown ﻿to ﻿the ﻿right) ﻿to ﻿make ﻿them ﻿appear. ﻿Show ﻿these ﻿bars ﻿to ﻿confirm ﻿the ﻿key ﻿bindings ﻿you ﻿set ﻿in ﻿step ﻿1. ﻿As ﻿an ﻿alternative ﻿to ﻿showing ﻿the ﻿the ﻿Bottom ﻿Left ﻿and ﻿Bottom ﻿Right ﻿action ﻿bars ﻿to ﻿load ﻿spells ﻿and ﻿items, ﻿you ﻿can ﻿instead ﻿use ﻿the ﻿action ﻿bar ﻿up/down ﻿arrows ﻿to ﻿show ﻿bar ﻿#5 ﻿and ﻿#6 ﻿(or ﻿press ﻿Shift-5 ﻿and ﻿Shift-6 ﻿by ﻿default). ﻿They ﻿are ﻿the ﻿same ﻿for ﻿the ﻿purpose ﻿of ﻿dragging ﻿on ﻿spells ﻿and ﻿items. ﻿Drag ﻿spells, ﻿abilities, ﻿consumable ﻿items, ﻿and ﻿on-use ﻿items ﻿to ﻿any ﻿of ﻿these ﻿30 ﻿action ﻿bar ﻿slots ﻿if ﻿you ﻿want ﻿WoW ﻿G910 ﻿to ﻿track ﻿their ﻿status. ﻿Later ﻿in ﻿game, ﻿WoW ﻿G910 ﻿will ﻿change ﻿key ﻿colors ﻿by ﻿watching ﻿these ﻿30 ﻿actions ﻿bars ﻿slots. ﻿If ﻿you’re ﻿using ﻿a ﻿custom ﻿bar ﻿mod ﻿with ﻿alternative ﻿buttons ﻿and ﻿bars, ﻿you ﻿still ﻿must ﻿put ﻿the ﻿appropriate ﻿spells, ﻿abilities, ﻿and ﻿items ﻿onto ﻿the ﻿Blizzard ﻿default ﻿action ﻿slots ﻿described ﻿above. ﻿You ﻿can ﻿then ﻿hide ﻿the ﻿Blizzard ﻿bars. ﻿Just ﻿keep ﻿track ﻿of ﻿your ﻿key ﻿bindings ﻿in ﻿your ﻿custom ﻿interface ﻿for ﻿step ﻿3. ﻿On ﻿the ﻿main ﻿WoW ﻿G910 ﻿window, ﻿click ﻿the ﻿“Program ﻿Colors ﻿and ﻿Keys” ﻿button, ﻿then ﻿in ﻿the ﻿window ﻿that ﻿pops ﻿up, ﻿click ﻿the ﻿“Map ﻿Keys ﻿to ﻿Action ﻿Bars” ﻿button. 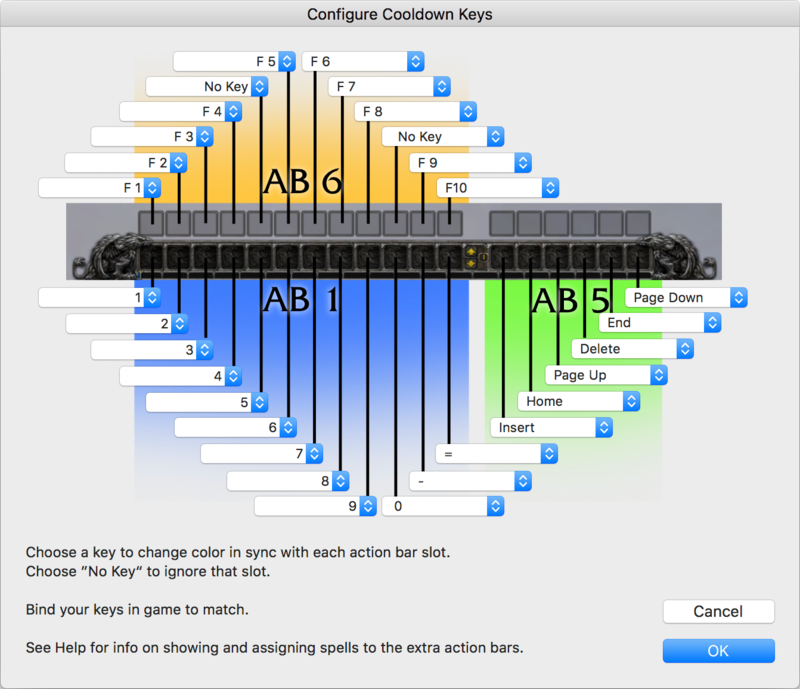 ﻿The ﻿“Configure ﻿Cooldown ﻿Keys” ﻿window ﻿will ﻿appear ﻿as ﻿shown ﻿here. ﻿This ﻿window ﻿shows ﻿a ﻿drop-down ﻿menu ﻿for ﻿each ﻿of ﻿the ﻿30 ﻿action ﻿bar ﻿slots. 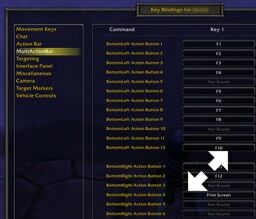 ﻿Use ﻿this ﻿to ﻿tell ﻿WoW ﻿G910 ﻿which ﻿key, ﻿if ﻿any, ﻿you ﻿have ﻿bound ﻿to ﻿each ﻿action ﻿bar ﻿slot ﻿in ﻿WoW. 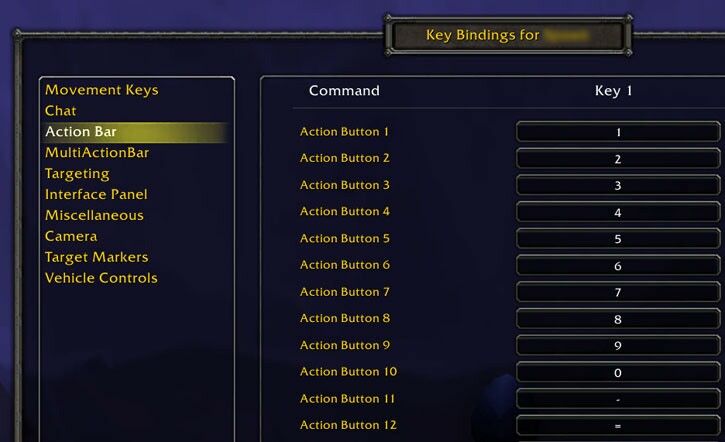 ﻿You ﻿can ﻿assign ﻿a ﻿key ﻿to ﻿an ﻿action ﻿slot ﻿without ﻿binding ﻿that ﻿key ﻿in ﻿WoW. ﻿In ﻿that ﻿case ﻿the ﻿key ﻿light ﻿will ﻿be ﻿a ﻿ready ﻿indicator ﻿only. ﻿The ﻿key ﻿lights ﻿you ﻿assign ﻿on ﻿this ﻿screen ﻿will ﻿change ﻿colors ﻿to ﻿show ﻿ready ﻿or ﻿not ﻿ready ﻿even ﻿if ﻿you ﻿hide ﻿the ﻿action ﻿bars ﻿on ﻿screen ﻿and ﻿replace ﻿them ﻿with ﻿a ﻿custom ﻿interface. ﻿To ﻿customize ﻿the ﻿colors ﻿used ﻿to ﻿indicate ﻿actions ﻿are ﻿ready ﻿or ﻿not ﻿ready, ﻿see ﻿the ﻿Color ﻿Profiles ﻿page.